Having a great looking smile can go a long way toward building self-confidence. However, for people with whittled, stained or broken teeth, smiling can be a painful experience. Thanks to advances in modern dentistry, there are a number of cosmetic dental treatments to help give you a brand-new smile that is straighter, whiter and evener. One of the most popular of these treatments is porcelain dental veneers. Porcelain veneers are thin pieces of porcelain shaped to fit over the front side of the teeth to recreate the natural look of teeth. They also provide strength, and resilience in comparison to natural tooth enamel. It is often the material of choice if you want your tooth to look more natural because they are made to match the shape and colour of your teeth. Teeth that are stained – either as a result of root canal treatment; stains from antibiotic medication or from smoking. Teeth that are worn out. Teeth that are whittled or cracked. Teeth that are misaligned, skewed or sporadically moulded. Porcelain veneers comprise of a compilation of a few thin ceramic layers which supplant unique tooth enamel. Porcelain veneers are an exceptionally effective alternative in situations where the original tooth has created poor colour, shape, and contours. It is additionally a decent choice for broken teeth, holes among teeth, and in a few circumstances where the tooth position is compromised and there are minor nibble related issues. 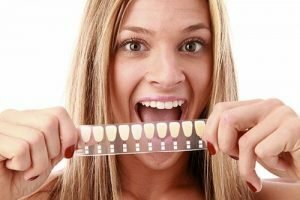 For a few people, superficial stains don’t react well to teeth whitening or bleaching. In these circumstances, a porcelain veneer might be the best alternative. Getting a dental veneer normally requires three visits to the dentist – one for a discussion and two to make and apply the veneers. One tooth or numerous teeth can at the same time experience the veneering procedure depicted below. This initial step involves your active cooperation. Disclose to your dentist the outcome that you are trying to accomplish. Amidst this arrangement, your dentist will inspect your teeth to ensure dental veneers are suitable for you and talk about what the methodology will include and some of its restrictions. Your dentist might as well take X-rays and possibly make a model of your mouth and teeth. To set up a tooth for a veneer, your dentist will take out around 1/2 millimetre of enamel from the tooth surface. Next, your dentist will establish a model of your tooth. This model is sent to a dental laboratory, which thusly builds your veneer. Before the dental veneer is forever solidified to your tooth, your dentist will incidentally put it on your tooth to inspect its fit and colour. Next, to set up your tooth to get the veneer, your tooth will be cleaned and carved. A unique cement is connected to the veneer and the veneer is then put on your tooth. Once legitimately position on the tooth, your dentist will apply a unique light beam to the dental veneer, which activates chemicals in the cement, making it solidify and fix properly. On the off chance that you tired and can’t wait to flaunt your teeth and smile, at that point we can help. At DonEast Supreme Dental, we have long years of experience with a wide range of cosmetic dentistry that can make a not exactly perfect smile into something superb.